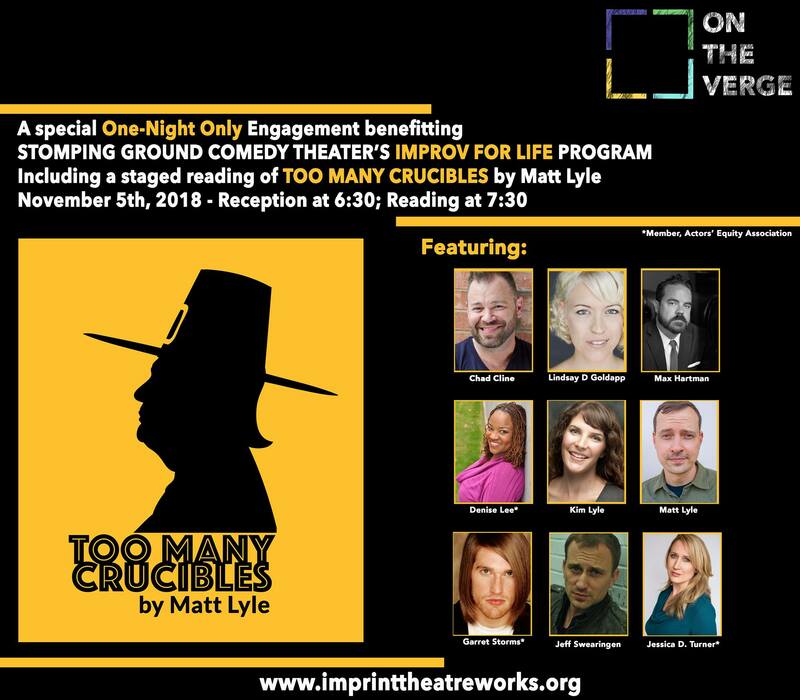 IMPRINT Theatreworks is pleased to announce the return of our ON THE VERGE series with a staged reading of an unapologetic new comedy by local playwright Matt Lyle, and featuring an incredible cast! Held the night before mid-term elections, it will be a hilarious evening – and all for a great cause! Proceeds from this event will be going to our friends at Stomping Ground Comedy for their inspiring Improv for Life program. The evening begins at 6:30pm with a reception in the lobby. The reading will follow shortly after at 7:30pm. In 1692, as the Salem Witch Trials rage in nearby Salem, the residents of Peabody, Massachusetts are going through their own crucible and they are just, like, really sick of crucibles. The surprising election of the boorish lout, Dunning Kruger, to be the local reverend has thrown the town into turmoil and pitted the townsfolk against each other like never before in the history of the New World and that’s saying something because the history of the New World is REALLY messed up. Ezekiel Farmer and his wife Verity must reconcile their differences (she voted for Kruger, he for the more experienced female challenger, Goody Constant Bending) and somehow find a way to resist the ugly tide that threatens them all. TOO MANY CRUCIBLES is an extremely unsanctioned companion piece to Miller’s classic THE CRUCIBLE that proves some witch hunts turn up witches. Matt Lyle is a writer, actor, and director living in Dallas, Texas. Mattâ€™s plays have been produced across the U.S. His plays, The Boxer, Hello Human Female, Barbecue Apocalypse and Big Scary Animals all garnered DFW Theater Critics Forum Awards for “Outstanding New Play” and Barbecue Apocalypse was nominated for an American Theatre Critics Association Steinberg New Play Award. Matt has been commissoned by Theatre Three, Dallas Theater Center and Audacity Theatre Lab. He is a member of the Dramatist Guild and the Playwrightâ€™s Center and was honored as the 2018 Distinguished Alum of the Stephen F. Austin State University School of Theatre. His work is published by Broadway Play Publishing.